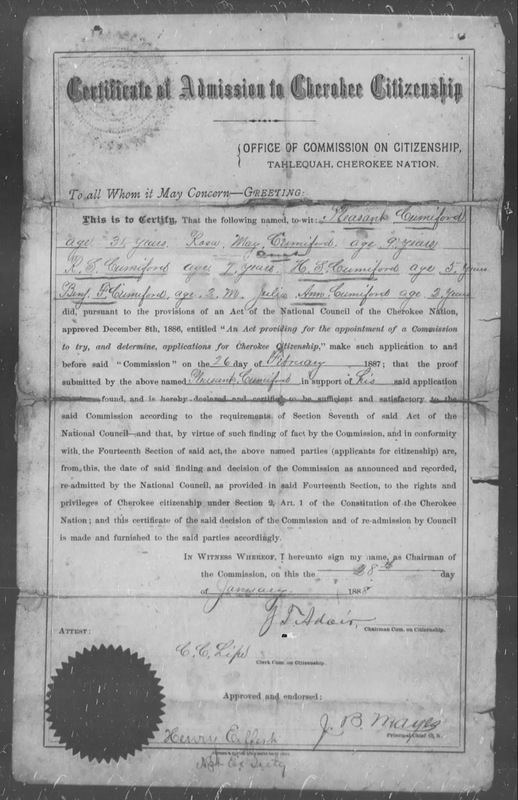 In 1887, a man named Pleasant Cumiford applied for citizenship in the Cherokee Nation. 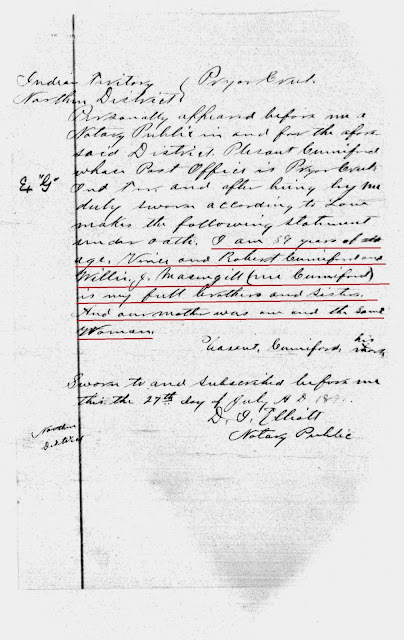 According to the testimony of standing witness, Watt Christie, Cumiford was born in Goingsnake District, Cherokee Nation, about 1857, to a Cherokee woman named Rachel Fisher. Christie testified that Cumiford's mother, a cousin to Christie, left the nation with her husband after the war and he never saw her again. 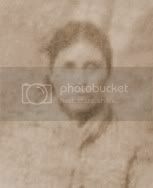 Christie continued by adding that Cumiford's mother, Rachel Fisher, was about 3/4 Cherokee and she was small when she came with the Emigration. He said Rachel's parents lived near Turnip Town in the Old Nation and that her father's name was Fisher. Pleasant Cumiford was admitted citizenship into the Cherokee Nation based on this testimony by Watt Christie. But should Cumiford have received citizenship into the Cherokee Nation? Only an examination of his earlier life will reveal the answer to that question. 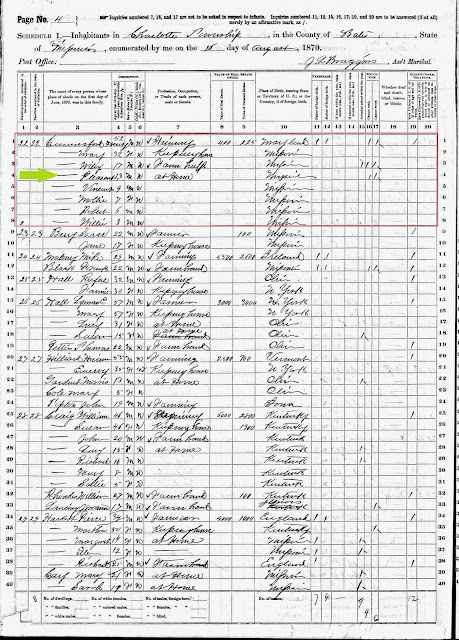 Pleasant Cumiford is found on the 1860 US Census, four years old, living with his father, Henry S. Cumiford (see Eastern Cherokee application) and a woman named Mary Cumiford, in Henry County, Missouri. His birthplace is recorded as MISSOURI. *Also note this is before the war. According to Watt Christie, Pleasant wasn't taken out of the Cherokee Nation by his mother until AFTER the war. 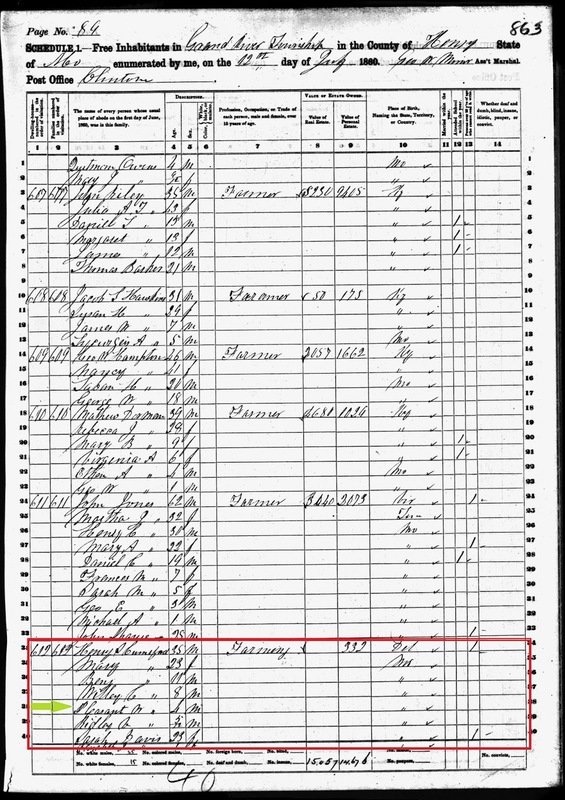 In 1870, Cumiford is found on the US census of that year, as 13 years old, again living with his father, Henry, and the woman named Mary, in Bates County, Missouri. 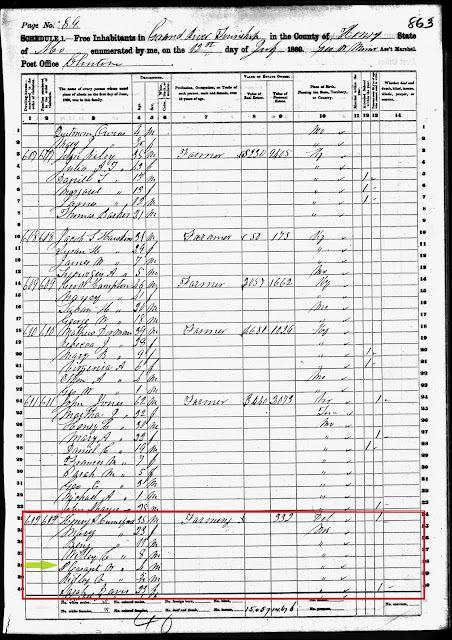 His birth place is once again recorded as MISSOURI. His race is listed as WHITE. I don't find Cumiford in another record until 1887 when he applied for and received citizenship into the Cherokee Nation, but the two censuses above bring into question the legitimacy of his claim that Rachel Fisher was his mother and that he was born in the Cherokee Nation. As stated earlier, Pleasant Cumiford acknowledged that his father's name was Henry. Henry Cumiford married a Louisa Thompson on January 20, 1848, in Missouri. Two sons, Benjamin and Wiley, were born to them before Louisa's death in 1853. 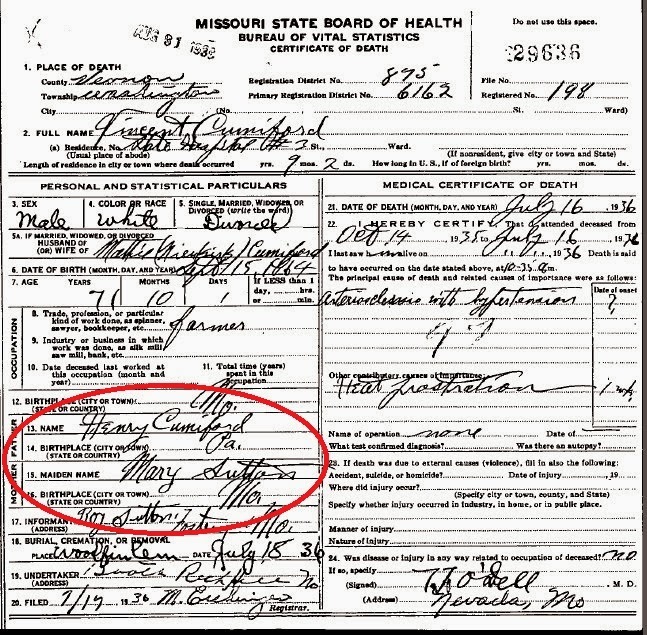 Henry then married Mary E. Sitton, daughter of Vincent Ridley Sitton, in Pettis County, Missouri, on November 1, 1855. Because of the gap between marriages, it is important to narrow down the birth year of Pleasant to evaluate whether he might have been born before or after the marriage to Mary Sitton. From 1860 through 1902, his birth year is consistently recorded as 1856 or 1857. Not only does it appear that Pleasant was born AFTER Henry's marriage to Mary, the approximate birth year also strongly suggests Mary was his mother, as well as the mother of the children that were born after Pleasant. 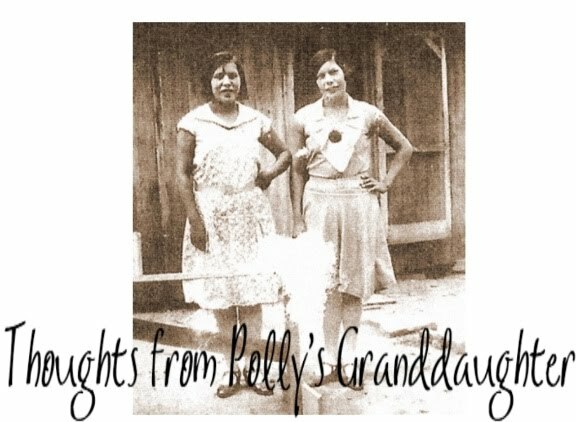 Odd as it is, knowing they were all born AFTER their father's marriage to Mary Sitton, Pleasant's siblings filed several applications for citizenship into the Cherokee Nation, claiming they, too, were the children of Rachel Fisher. "I am 39 years of age. Vince and Robert Cumiford and Wilbi J. Masingill (nee Cumiford) is my full brothers and sister. And our mother was one and the same woman." 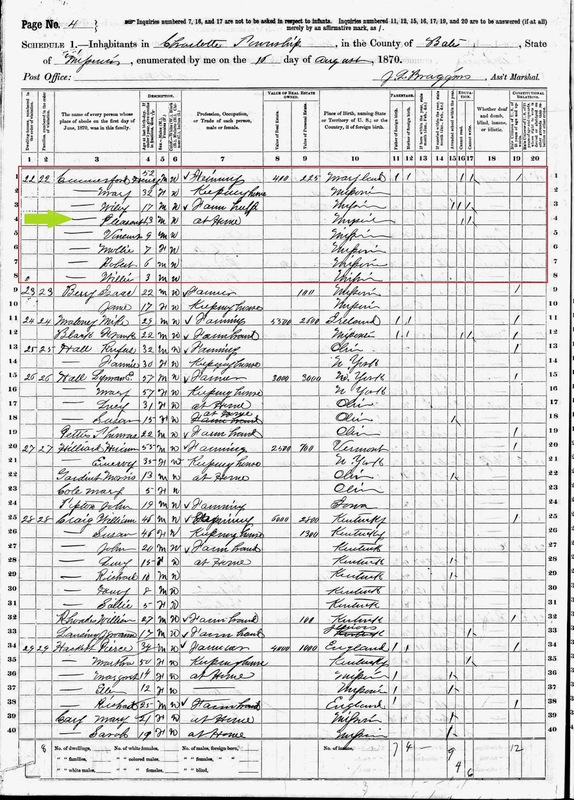 Henry S. Cumiford married Mary E. Sitton before these children were born and he was living with her after these children were born, so it is logical for us to think she was the mother of his children. Pleasant Cumiford swore under oath that he and his three younger siblings were full siblings and they all had the same mother. So who was their mother? 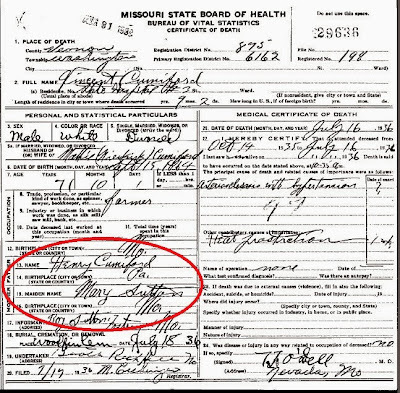 According to Vincent Ridley Cumiford's death certificate, his mother, and therefore the mother of his three full siblings, including Pleasant Cumiford, was MARY SITTON, a white woman born in Missouri. *Note that Vincent was named after Mary's father. Pleasant Cumiford was NOT the son of Rachel Fisher, nor was he Cherokee. But he gained citizenship into the Cherokee Nation with the help of standing witness, Watt Christie. Stay tuned for the next installment in the Standing Witness series, The Devil is in the Details, where I continue to debunk the lies told by both Pleasant Cumiford and Watt Christie.